Editor’s Note: A previous version of this story incorrectly reported the increase in average annual temperatures in the state over the 20th century, as well as the snowfall reduction in some national parks. Over the course of the century, some parts of Arizona saw the average temperature rise by as much as 2.8 degrees Celsius, or 5 degrees Fahrenheit. An average snowfall reduction of 7 percent was seen in the Colorado Rockies. The story below has been updated to reflect the correction. Clients who used the story are asked to run the correction that can be found here. 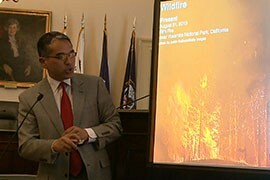 WASHINGTON – More dead trees and the higher temperatures that come as a result of carbon emissions are contributing to an increased long-term risk of wildfires in the Southwest, a panel of climate experts said Wednesday. 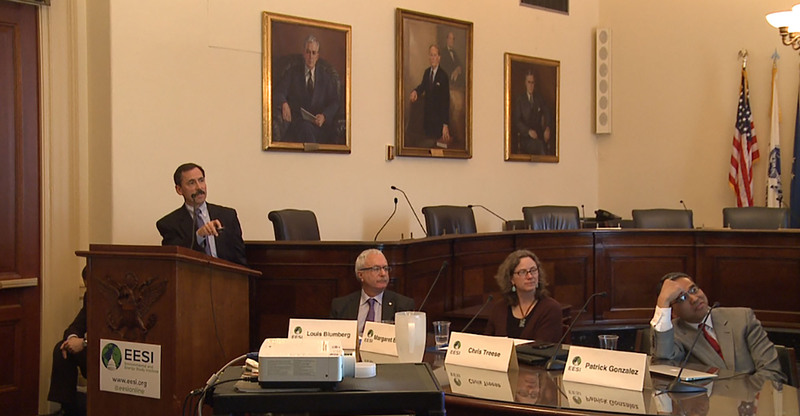 The panel, convened by the Environmental and Energy Study Institute, said the impact of climate change is also being felt in Arizona’s water supply. Those problems and others will only get worse in the coming years unless measures are taken to limit emissions, and thin overgrown forests that feed wildfires, they said. Gonzalez presented research that showed Arizona had the the highest increase in average temperatures among Southwestern states over the 20th century, with some parts of the state seeing an increase of 2.8 degree Celsius, or about 5 degrees Fahrenheit. The research was based on data from the Intergovernmental Panel on Climate Change and the International Journal of Climatology, he said. “A few degrees may not seem like a lot, but it can be the equivalent of flattening a mountain or moving a Colorado town down to New Mexico,” Gonzalez said. But at least one skeptic challenged the panel’s claim that rising temperatures are the result of modern industrial activity. In addition to bringing hotter, drier weather, climate change has led to a doubling in the mortality rate of trees between 1955 and 2007, adding potential fuel for wildfires in Western forests. 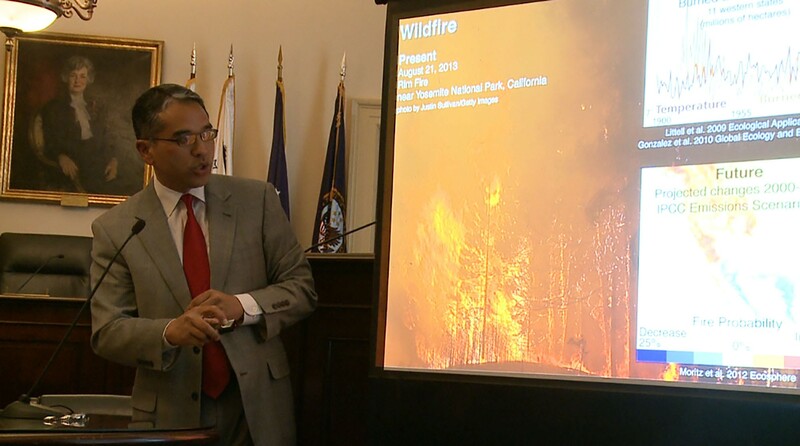 Gonzalez said one way to lower the likelihood of wildfires is to reduce the excess brush that can provide extra fuel and increase the chance of an out-of-control wildfire. Climate change has also affected the water supply, said Chris Treese, an external affairs manager for the Colorado River District. He presented studies that showed a decline Lake Powell and Lake Mead elevations, with Lake Mead projected to continue dropping. Also alarming is the imbalance between the location of water and the customers who need it most, he said. “About 90 percent of the (Colorado River) basin water is located across the north, but about 90 percent of the people who use it live more to the south,” Treese said, pointing first to Utah and Colorado, then to Arizona. He stressed the importance of water conservation efforts as a counter-measure to climate change to keep the imbalance from getting worse. 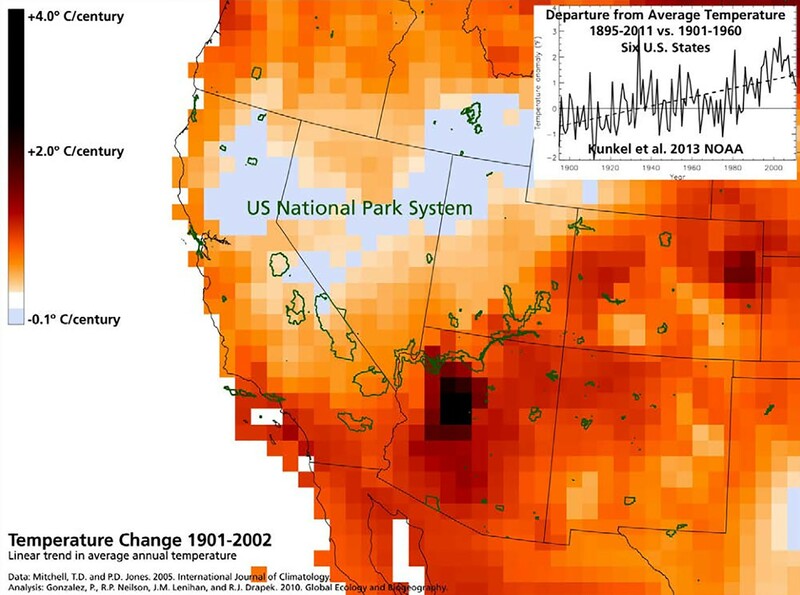 Patrick Gonzalez, a climate change scientist with the National Park Service, said a likely increase in future wildfires is among the many changes in the Southwest that could be brought on by climate change. 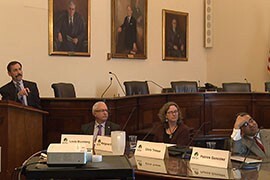 Chris Treese, external affairs manager for the Colorado River Water Conservation District, speaks as part of an Environment and Energy Study Institute panel on the effects of climate change on the Southwest. 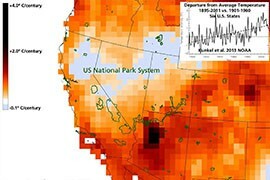 Average annual temperatures in the Southwest grew fastest in Arizona over the 20th century, according to the National Park Service, where some parts of the state saw an average increase as high as 2.8 degrees Celsius, or 5 degrees Fahrenheit, over course of the century.